Kate Phillips and Ben Davies are Project Managers in our Innovation and Growth team. 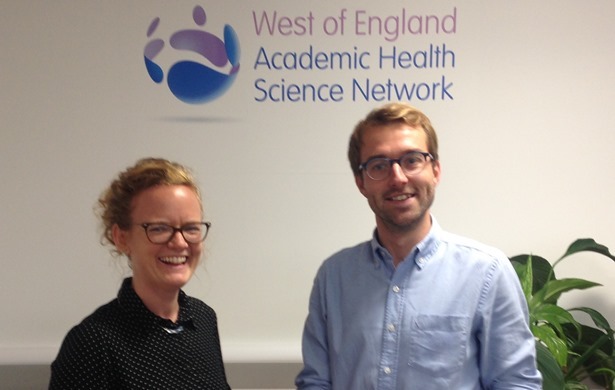 Our Communications Officer, Lauren Hoskin, caught up with them both to find out what their work involves and how it makes a difference to healthcare. What are your roles here at the West of England AHSN? Kate: We both manage something called the European Regional Development Fund (ERDF) programmes, which are regionally focussed programmes that provide fully-funded business development support and grants to small and medium enterprises (SMEs) in the region. Then we also both provide business development support, where we help local innovators (SMEs, companies, healthcare professionals etc) to find a more defined pathway in building their innovation and navigating the health and care landscape. Can you give any examples of the innovators you work with? Kate: Between us we meet around four new innovators a week, sometimes more, covering pretty much every aspect of healthcare. So it could be a digital product that helps monitor the upkeep of hospital equipment, an app that helps women struggling with breastfeeding, a new type of diagnostic test or even novel surgical equipment. We sometimes work with innovators with lived experience who are then driven by that passion. Perhaps they’ve had a clinical challenge or seen a loved one struggle and they use their experience to make a difference. But I particularly enjoy working with academic innovators, so people who have done some exciting research and have evidence to show that a particular innovation can really work. They’re then translating their findings into a product or system that’s going to make a difference to patients. Ben: I think that’s where we are particularly important in their journey, because being an academic you can have an evidence base but it might be regional and relatively small. If you’re looking to take a product further then you really need to consider how you can broaden that evidence base in a way that NHS commissioners would find it applicable to their needs. That’s the real challenge. What sort of business support do you offer? Kate: First, we will have a chat to really understand the innovation and get a summary of the product or service. We’ll then take this to the Innovation and Growth team for their feedback or recommendations. These initial chats are really varied and depend on the stage of development and innovator’s expertise. We ask questions, for example which clinical challenge does your innovation address? What is the business model? Who do you think your customer is in the NHS? We always start by providing access to our innovation newsletter which contains lots of useful information on funding and events. Then, depending on feedback from the team we can offer further bespoke support which takes many guises, including completing market analysis, individual searches through our funding database or an invitation to exhibit at an event. Depending on the offer, we can ask our members if they are interested in learning more about the innovation and can make introductions accordingly. We sit between the push and pull and try to facilitate those interactions. We also love talking to innovators about our ERDF programmes and will arrange follow up meetings with people who may be eligible to apply. If the business need falls outside of the AHSN remit we can signpost innovators to other sources of support in the West of England for example to Business West or SETsquared. Then there are different networks such as TechSPARK and One HealthTech, which has a focus on getting women into the tech industry. Ben: Sometimes they might be looking to run a pilot study locally to test their idea, then through that pilot they’re looking to develop an evaluation. We can help signpost to resources such as the online evidence and evaluation toolkits. After that, one of our directors might say they’d like to speak with them in more detail and give them specific guidance. Ben: There are a few elements to our work. One aspect is improving patient outcomes and making the health and care system more efficient. The other element is to provide economic growth to industry across the region. When we’re presented with a new innovation we’re looking for the evidence that there is a need for the product and that it will make improvements to patient outcomes or systems efficiency. Sometimes these outcomes are direct, such as a device that helps a patient manage their own condition. Or sometimes these outcomes are less direct, for example an innovation that helps a physician manage their workload so they can spend more time focussing on their patient. What’s it like working in the Innovation and Growth team? Ben: It’s great to be working with individual innovators and SMEs who have so much energy about their product. It feels like we can be influential in their journey and provide them with the introductions, advice and guidance that they’re looking for. We hear it when people give their feedback that the AHSN has been invaluable in helping them navigate the health and life science sector, which really is the toughest place you can try to set up a business. It definitely feels like we’re making a difference.